Heating water or the interior of a home or building is a relatively easy process. One can use solar tubes, solar boxes or even solar concentrators. Often people circulate and heat water through these devices and then store that water in hot water tanks. The hot water can then be used for potable water and also run through heat exchangers or hydronic heating units to heat the living/working space. What's not as easy is maintaining that heat when the sun goes down. Large commercial power generators may use molten salt to store heat. That's not really practical for a home or small business. Currently, one of the better options for private individuals is to utilize huge hot water storage tanks. In order to maintain heating potential during the night, it can tank hundreds of gallons of hot water storage and that's not very practical due to the space requirement for the tank. 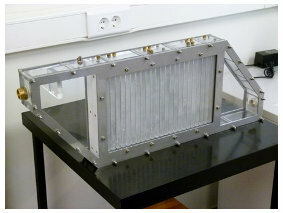 Universidad del País Vasco (a university in Spain) has designed a more compact method of storing heat. Their device is made out of aluminum plates with a commercial paraffin encapsulated inside of it. The paraffin is a Phase Change Material (PCM). As warm water is circulated through the aluminum channels, the paraffin heats up and changes from a solid to liquid state. This phase change allows a high quantity of energy to be stored in a smaller density that an equivalent water tank. When hot water is needed, the cooler water is circulated through the device and the liquid paraffin yields up its heat and the paraffin, once again becomes solid. One of the problems with using PCMs for heat storage is that due to their low thermal conductivity, they can take a long time to yield up their heat. Because of the very thin aluminum plates in this design, heat can be extracted at a rate very similar to a water tank. The research group is already looking at other potential PCMs that allow greater storage capacity and are cheaper than paraffin. Some of these PCMs include fatty acids and other organic materials. The heat storage device requires 50% less volume than an equivalent water tank and is much more flexible in terms of it's footprint, which makes it easier to design into a building. For example, it could be built into the corner of a room or even shaped so that it could be placed in a false ceiling. It will be interesting to see if creative private individuals take this theory and create their own device that operates on a similar principle of using a Phase Change Material instead of water.